New Ipswich Town signing Jonas Knudsen says he is known as "the new Rory Delap" by some in his native Denmark because of his long throw-in ability. 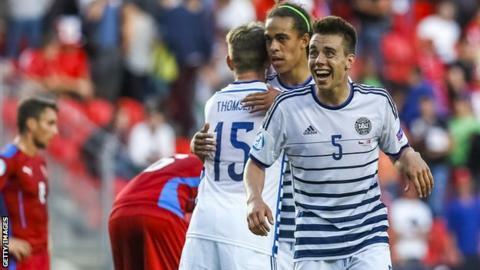 Left-back Knudsen, 22, joined Town from Esbjerg on a three-year deal on Friday. Former Stoke City midfielder Delap was famed for his long throws. "My dad also did it when he played," he said. "When you're a kid you look up to your dad. I see him make the throw ins, and as a little kid I did it and now it's one of my good things." Former Everton and Manchester United boss David Moyes once labelled Delap as "the human sling"
Knudsen, who has been capped twice by Denmark, added that former Ipswich defender Thomas Gaardsoe was a big influence on his decision to move to England. "He's a very good friend," he said. "When I was a young kid he was an older man, he took me under his arm and said I had to go to the Championship or England to play one day. "And now I'm standing here, it's so fantastic." Meanwhile, Ipswich have offered contracts to former Sheffield Wednesday midfielder Giles Coke, 29, and 31-year-old Guinea forward Larsen Toure. Delap: The former Republic of Ireland international helped Stoke stay up in their first Premier League season in 2008-09, assisting goals that saw the Potters defeat teams including Aston Villa, Sunderland and Arsenal. Former Chelsea boss Luiz Felipe Scolari said of Delap's throws: "I think he puts the ball in better with his hands than his foot - it's fantastic." Andy Legg: Legg, who played for teams such as Ipswich, Swansea and Cardiff, once held the world record for his throw-in of 44.6m. Dave Challinor: Ex-Tranmere defender Challinor broke Legg's world record with a throw of 46.34m at Prenton Park in 1998, and helped Rovers to the 2000 League Cup final with his sideline deliveries. He is now manager of National League South side AFC Fylde. Ian Hutchinson: Often called "Windmill Arms" because of the distinctive way his arms rotated after throwing the ball. Hutchinson's ability was put to good use in Chelsea's 1970 FA Cup Final replay against Leeds, when his throw was headed in by David Webb in extra-time to help the Blues win the trophy for the first time. Thomas Gronnemark: Knudsen's fellow Dane is the current world record holder for the longest throw-in, with a staggering attempt of 51.33m registered in Horsens, Denmark, in 2010. Read more on Football League Managers XI: Who would make the team?